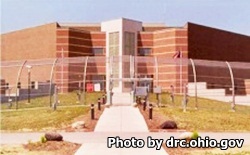 Ohio State Penitentiary is located in Youngstown Ohio. It is an administrative maximum security prison that houses mostly maximum security and administrative maximum security male offenders. The capacity of Ohio State Penitentiary is 504 inmates. Although this prison is the highest security, it is renowned for the humane treatment of offenders, and the rehabilitative programs offered. Inmates can participate in adult basic education and GED programs. Inmates at Ohio State Penitentiary have several programs aimed at self development. The Accepting Responsibility program is based around inmates realizing the root cause of destructive behavior lies within. The "Fear: The Anger Trigger" program relays the cause of an inmate's anger and how it effects everyone around them including family, and the M.A.N. U.P. Program which stands for Men Acknowledging Nature's Ultimate Purpose, helps to empower inmates by showing them the importance of their role of being a leader, provider and protector. Visiting at Ohio State Penitentiary is by appointment only. You can schedule an appointment by calling (330)-743-0700 ext 2111, or by emailing DRC.VisitationOSP@odrc.state.oh.us. Visitation occurs on Wednesdays, Thursdays, Fridays, Saturdays, and Sundays from 8:30am-2:30pm. Inmates can also have video visitation with approved visitors through JPAY. You must sign up with JPAY for video visitation. Video visits are 30 minutes in duration and you are charged a fee.